CNS Canada – Despite above normal precipitation over the last couple of months, when comes to the drought, the Prairies are not out of the woods as winter approaches. 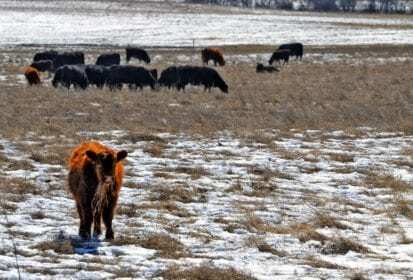 We are headed into an El Nino, at least according to the Australian Bureau of Meteorology and the National Oceanic and Atmospheric Administration,” said Bruce Burnett, director of weather and markets information for Glacier MarketsFarm. Burnett said there are already warmer temperatures over the Pacific Ocean and an El Nino would be bad news for grain producers should the phenomenon come fruition. “The chances are we are not going to receive a lot of snowfall. So that’s going to leave those areas dry going into the spring. For next growing season, especially like this year, they are going to require frequent, reliable rain during the growing season,” he explained. Patrick Cherneski of the National Agri-Climate Information Service said Canada has a probability of experiencing an El Nino in the 70 per cent range. He said an El Nino would mean a warmer winter for Western Canada with less precipitation and that would contribute to overall drier conditions. But he remained cautious about the full effects of the El Nino. “Quite often the arrival of the conditions, the climate phenomenon, does arrive but over the past several years they arrive slower than expected and not at the magnitude expected. In this case for Western Canada that would be a positive,” Cherneski said. In light of this fall’s precipitation, Burnett said southern Manitoba remains below normal in terms of moisture and there is a chance for southern Saskatchewan and southern Alberta to receive late season precipitation. “But at this time of year you tend not to get as much precipitation just because of the atmospheric dynamics are far more subdued,” he said. As for the central Prairies, Burnett said they are a bit dry and that the northern Prairies almost have too much moisture. In turn, harvesting in northern Alberta and northern Saskatchewan could be delayed to until spring. Cherneski said moisture deficits across the Prairies will need a while to be made up. “Once harvest has been completed producers will be very happy to see a few good rains or more snow,” he said. Cherneski said the drought triggered the Livestock Tax Deferral. Cattle producers who have reduced their herds by 15 per cent can defer their income.